A Spanish version of this announcement is available here. HILLSBORO, OR (March 20, 2018) -The Hillsboro Hops (@HillsboroHops) announced that the team will rebrand themselves as "Los Lúpulos de Hillsboro" for five home games during the 2018 season starting on June 25. The "Los Lúpulos de Hillsboro" nights are: June 25, July 12, July 17, August 22 and September 1. This rebrand is part of MiLB's national "Copa de la Diversión" initiative and 33 teams from across the country will participate. 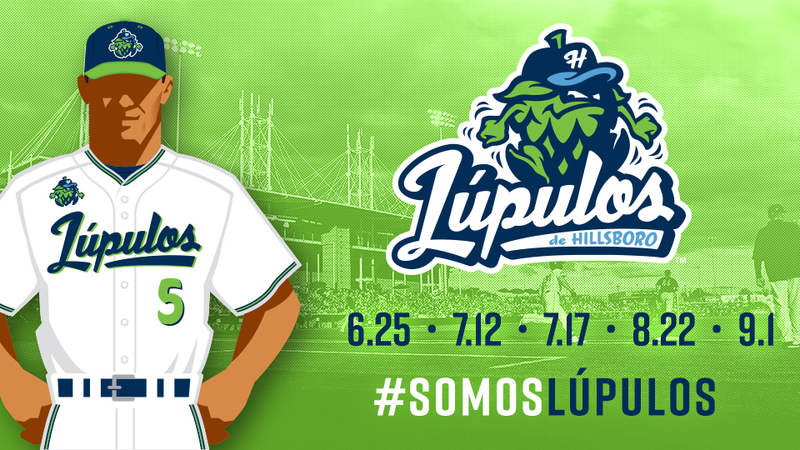 Further expanding its award-winning brand identity, the Hillsboro Hops will adopt its direct Spanish translation - "Lúpulos" - for the Copa de la Diversión event series. The name recognizes Hillsboro's proud agricultural heritage and the fact that Oregon is the second-largest, hop-producing state in the U.S., in addition to being a term regularly used in baseball. The Hops will wear special uniforms and on-field hats during the Los Lúpulos de Hillsboro nights. A "Plan de Lúpulos" will be available for fans wanting to purchase a mini-season ticket plan to the 5 games where the Hops will celebrate their Spanish-speaking fans and players. Fans can purchase "Plan de Lúpulos" tickets starting today at hillsborohops.com or at the Hops ticket office. "The fact that the Hispanic demographic in our area is nearly 25%, combined with the substantial number of Latino players we have on our roster each year, we wanted to celebrate our connection with the Latino community over more than just one night," said Hops President K.L. Wombacher. "It is important to us that this comprehensive effort comes off as genuine and authentic in expanding the diversity of our fan base to reflect that of our community." The Lúpulos on-field cap is available now at the Hillsboro Hops Team Store at Ron Tonkin Field, as well as, their online shop.